What is the biggest mistake you made in 2008 and will not make again in 2009? I have to laugh at this question LOL! The biggest mistake I made was not thinking before I spoke, and I will try like HELL to never do that again. Do you make New Year’s resolutions? Why or why not? Even if I don’t make them consciously, it’s such a tradition that I think most folks can’t help but make them, even subconsciously. My resolution was made back in September, though and will carry over to the New Year; that is to get healthy! Who do you nominate as “Man or Woman of the Year” for 2008? My Dad. He’s quiet, doesn’t talk much, doesn’t overeat, overdrink, doesn’t smoke…some folks would call that boring. Dad’s always marched to the beat of his own drummer, but always, he’s loved his kids and we knew that, beyond a shadow of a doubt. What was your greatest accomplishment in 2008? Losing weight and keeping it off; 17.5 pounds so far! I’ve gotten help from my cousin and friends in the form of inspiration and encouragement and I very much appreciate it! Even if Michelle DID drag me to The Melting Pot this weekend LMAO! Kidding…if I hadn’t wanted to go, I wouldn’t have And the cheese fondue was delicious. Yesterday, it was about 60 degrees here and I took the dogs to the beach…where we saw a man swimming! Now…it WAS warm yesterday, but not THAT warm! Brrrrr….!!!! Wolf thought it was funny! How was your long holiday weekend? Got a cold, probably from all those cookies and the cream in the Kahlua. Good to check in and see how your holidays went. 60!!! We were battling just to get up to 30 degrees yesterday! Enjoy! I’m so impressed with your 2008 accomplishments! And you are so sweet with your dad. My holiday weekend involved my oldest daughter and her partner going home (boo) and lots of Prison Break, Season 4 (yay). Also, Laura, Tom and I walked a couple of miles to a local coffee place and back — wearing short sleeves and sandals. Oh yes we did. Shine on San Diego sun. Damn if the internets didn’t just eat my comment. It was long too. Anyway, glad you had a fun holiday weekend, love the photos of Wolf, and I’m with you on the 17.5 (it was 20 before the cookie fest this weekend). I try not to make resolutions, but to define what I want and make goals instead. A goal feels more solid than a resolution somehow. Look at Wolf! Such a handsome boy! Congrats on the weight loss. Wow, swimming in December…My Mr likes to do an annual Polar Bear Dip when we’re in BC each year. I always go and get pictures, he even made the paper one year for staying in so long on a particularly cold day. Love that photo of Wolf, he has such a cute smile! I finally got my post up…I’m dragging today. Love the grin on Wolf’s face. He knows something. I think it’s probably a good thing he can’t talk people talk, because he’d so spill the beans! OMG, swimming? Seriously? Awww, Wolfie looks so cute. 17.5 pounds? Whooo hooo! That is marvelous. I am so happy for you. And I must agree about your dad– any dad that has kids that know the he loves them is a good dad. Woohoo on your wt loss – you’re so awesome I’m proud of ya! Your Dad sounds like such a neat guy, and I always admire people who a little off the beaten track. Love the pic of Wolf!! Again, many congrats on the weight loss. I like making the resolutions, even if I break ‘em. It just gives me something to aspire to! Wolf is definetly laughing there, LOL. that looks like a wonderful way to spend a day, we were at the beach over xmas and got to wade a little ourselves congrats on the fitness and weight loss, I should follow your lead – Happy New Year!! I blogged about my Saturday–it was a head start on my new year’s resolution to put down the computer and get off my a** more! Great answers…and congrats on the 17.5 loss…good job. And the beach pics?…loving Wolf’s smile and the early polar bear swim…brrrr…bet that was refreshing! Here’s to a great 2009! Kudos on the weight loss [and good for you indulging in The Melting Pot! We must have our rewards]. My long weekend is still going (one of the many perks of teaching ) but it was nice to finally get up to see my parents & sister after being snowed in. He’s smiling! LOL. That’s awesome. I wish my dogs did that. We keep trying to get them to bark “Mama” too, like that dog on America’s Funniest Home Videos. But they’re not going for it. I think Hoop and I have to face the facts, our dogs are dumb. another great Wolf portrait! 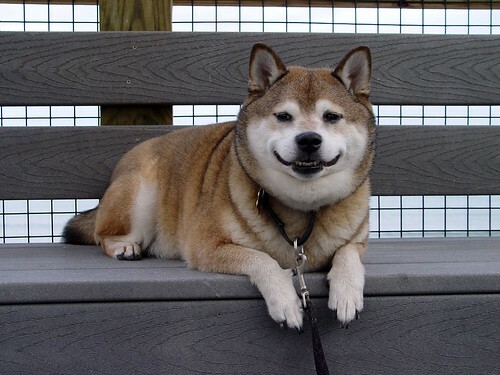 love the way Shiba’s smile – so endearing. Congrats of the great accomplishment. That’s such a tough one. … long weekend? did get something MAJOR (in my mind, at least) accomplished, but the weekend itself seemed a bit too short. lol. LOL-your dog is so cute! I just adore that photo of Wolf!